How to tune my Virtual Machine for best performance? In Activity Monitor on your Mac you can see the prl_vm_app process, (Parallels VM - in Parallels Desktop 8) (responsible for running virtual machine) which consumes over 100% of your CPU. 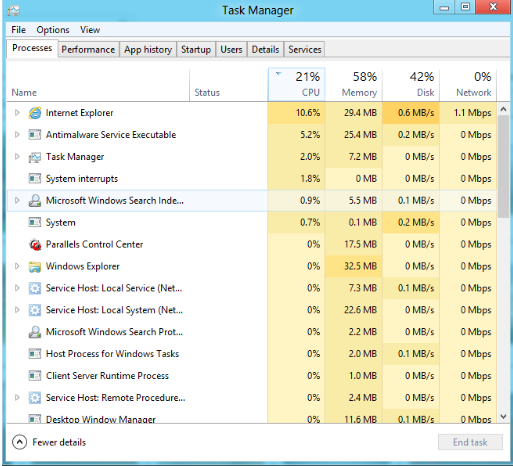 At the same time Task Manager in Windows Virtual Machine shows reasonable amount of CPU to be used (~10 - 20%). Your Mac has more than one CPU installed. In Windows: No matter how many CPUs you have, if you have (for example) 6 CPUs installed, the total consumption of all 6 CPU resources will equal 100%. In Mac: Multiply the number of CPUs you have by 100%. For example if you have 6 CPUs installed, the total consumption on Mac will equal 600%. Some of the CPU power on the Mac side is also used for visualization purposes. Based on the example on the screenshots above, 17% CPU in Windows virtual machine equals to 17 × 6 = 102% on the Mac side, plus 8.5% for visualization purposes. 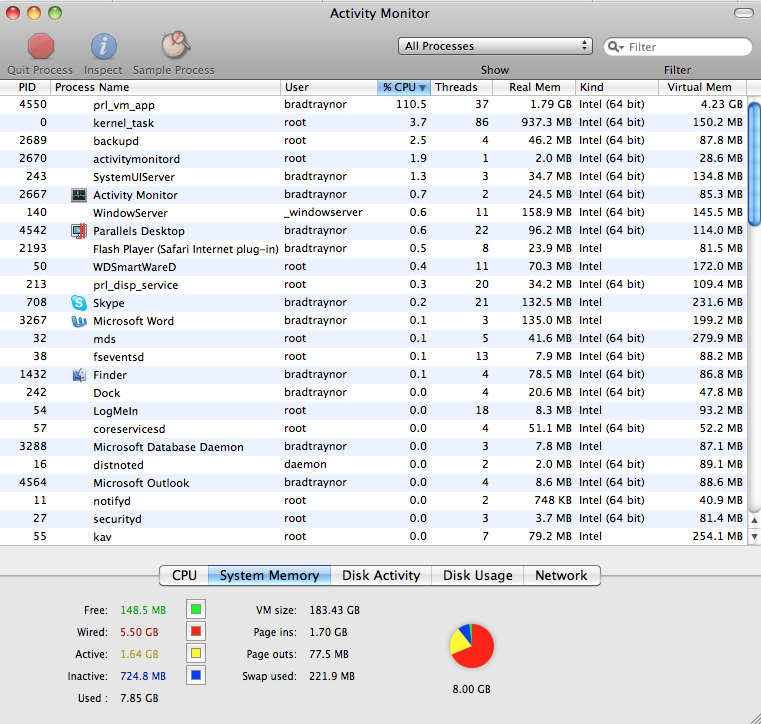 It means Parallels uses 110.5% CPU from 600% in total, so Mac has plenty CPU left for other processes. In case your Mac has 2 or more CPUs, consumption around 100% in Activity Monitor is acceptable and should not decrease your Mac performance. So no actions are need to be performed. If you feel the performance has been decreased and you have troubles operation in Mac or Virtual Machine, please check KB 116263.